WASHINGTON (CNN) -- President Obama took the first step Tuesday in what could be a legacy-making effort to restock the federal courts with more progressives, naming an Indiana political veteran as his first judicial nominee. 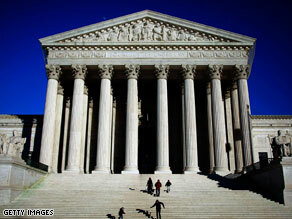 President Obama's recent judicial pick may hint at a fight over a vacancy on the Supreme Court. Judge David Hamilton was chosen to fill a vacant seat on the U.S. Court of Appeals for the 7th Circuit, based in Chicago. He is currently a federal trial judge in Indiana, and has been on the bench for 14 years. Right-leaning groups have sounded the alarm, warning he has a "pretty clear leftist political record." If confirmed by the Senate, he would fill one of 56 current vacancies in the courts, out of 875 authorized positions. Obama praised Hamilton's "long and impressive record of service and a history of handing down fair and judicious decisions." The White House calls him a "moderate" judge. The state's GOP senator, Richard Lugar, said he would "enthusiastically support" the nomination. Hamilton had worked as counsel for then-Gov. Evan Bayh, a Democrat, who is now a U.S. senator and who helped spearhead the nomination. The Senate signs off on all of the president's judicial choices and such bipartisan support -- particularly from a nominee's home-state delegation -- is key to ensuring all nominees get a committee hearing and vote. Conservative groups already have signaled their displeasure with the president's first choice. "Judge Hamilton is no 'moderate,' as the Obama White House is trying to spin him," said Wendy Long of the Judicial Confirmation Network. She cited the judge's prior work for the Indiana ACLU chapter. "He appears to have made rulings that show his willingness to bend the law to reach outcomes favored by his ACLU allies, which are inconsistent with the proper role of a judge under our Constitution," Long said. Fights over judicial nominees have grown increasingly partisan and nasty in recent years, sparked by the conformation fights over Robert Bork and Clarence Thomas for the Supreme Court. Bork was rejected by lawmakers, while Thomas now sits on the high court. Many of former President George W. Bush's judicial choices were blocked by Democratic senators, and his two Supreme Court picks were the subject of massive ad campaigns launched by advocacy groups on both sides of the political debate. Conservatives have vowed to give Obama the same treatment over his choices. Legal sources say Obama's legal team is in the midst of an aggressive effort to fill bench vacancies as soon as possible, working closely with key senators and Democratic legal advisers. Most of Bush's choices were not named until August 2001, seven months into his first term. "The [Obama] White House and the Justice Department certainly have people there already thinking about the issues, compiling lists, starting to vet the backgrounds of those candidates," said Edward Lazarus, a Supreme Court legal expert and a legal adviser to the Obama transition. The political and practical stakes are high. Top federal judges meeting this week for their semi-annual conference in Washington issued a statement Tuesday, asking Congress to create 63 new federal judgeships. Judge Anthony Scirica, chairman of the Judicial Conference's executive committee, told CNN that the increasing caseload, especially immigration and criminal cases along the U.S.-Mexico border, has created concern that courts are being overwhelmed. Scirica, who also is chief judge of the U.S. Court of Appeals for the 3rd Circuit, based in Philadelphia, said he was "hopeful" lawmakers would provide the additional resources. Obama legal aides have privately said the president is not interested in choosing "extreme" liberals to the bench, an idea echoed by some legal analysts. For their part, Republicans have warned the White House not to shut them out of the selection process. In a March 2 letter, 41 GOP senators urged Obama "to consult with us as it considers possible nominations to the federal courts from our states." If not consulted, they said, "The Republican Conference will be unable to support moving forward on that nominee." Translation, say liberal groups: filibusters and obstructionist tactics. "Republican senators fought hard against some of President Clinton's candidates," said Nan Aron, president of the Alliance for Justice, who also praised Hamilton's selection. " I think we saw it during Eric Holder's hearing [for attorney general]. Republican senators were testing out messages, not designed to deny confirmation to Eric Holder but to test them to see whether those tactics would work with some of Obama's judicial nominees. That's going to happen. There's no question about it." All of the fight over lower-court nominees is just the opening act to a potential upcoming Supreme Court vacancy. Bush burnished his conservative credentials by naming Chief Justice John Roberts and Justice Samuel Alito to the high court, and helped increase the overall conservative bent of most federal courts. Republicans have controlled the White House -- and thereby court nominations -- in 28 of the last 40 years. Seven of the nine high court members were named by GOP presidents. Obama has said Justices Stephen Breyer and Ruth Bader Ginsburg -- liberals named by President Clinton -- are his kind of judges, but Obama has spoken only in general terms about the type of person he would nominate. "I will look for those judges who have an outstanding judicial record, who have the intellect, and who hopefully have a sense of what real-world folks are going through," he said at the October 15 presidential debate. Many Supreme Court watchers predict Obama will likely get one, perhaps as many as three or four high court picks in the next few years. The question is who will retire first, and when. Court sources continue to say there are no indications any justices plan to step down voluntarily anytime soon. Ginsburg announced Tuesday she will undergo outpatient chemotherapy for her pancreatic cancer, but has told friends privately her recovery is going well, and she is staying put. But at an event in Boston last week, she said change may be in the air. On the subject of court retirements she hinted cryptically, "We haven't had any of those for some time, but surely we will soon."